Autumn is here; the kids are back to school and its time to start a new yoga class! Classes with Laura at Penn Yoga offer the ideal opportunity to spend some much deserved time on yourself, now your lovely little (or big) ones have gone back to school. The Autumn term is the ideal time for new challenges for both you and the kids. If you are a beginner or have never tried yoga before, my Sunday class in Draycott is great if you want something relaxing and chilled (with the option for intermediates to challenge themselves if they choose). Both ladies and gents come along to this class, so you will all fit right in. my yoga class for Athletes (and non-Athletes) on Thursday nights in Derby may be just the thing to complement any sports training programmes. If you are a more experienced yogi, then this class would also fit the bill. Come and join this friendly class of both men and women who enjoy a challenge. One of the main aims of my classes is to encourage students to make intelligent choices about their yoga. It is essential to listen to your own body and be guided by what it is telling you: not what your head is telling you. This not only allows you to be in the present moment, but it also helps you to look after your body and learn to recognise what it needs. Options for poses are therefore always offered in my classes: you pick the one that suits you on that day. Not the the option you did last week, or the option you want to achieve next week. The photography clearly shows how one pose can be modified using the body or props. All options have the same benefits, but every body will need a different option. 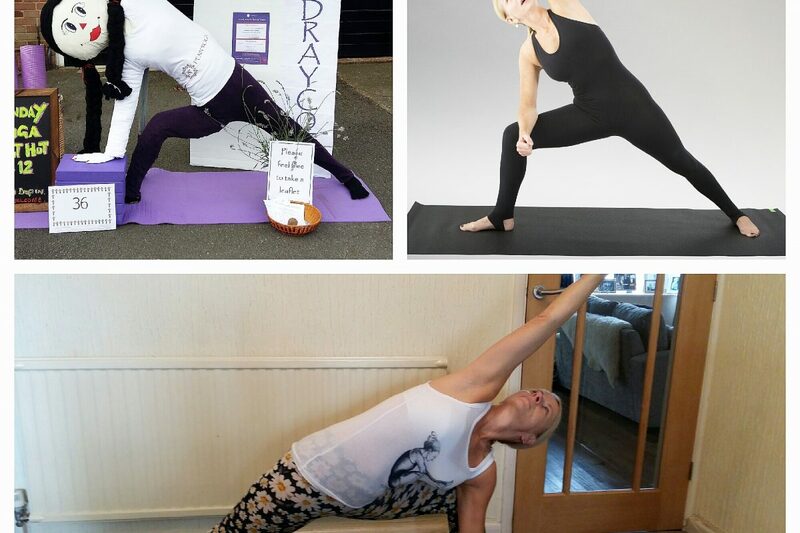 Learning to recognise your body’s needs is a skill that can be used both on and off the mat, and can help you learn when you need to sleep, slow down or do some more yoga! contact me for more information or if you have any questions. You can find further details about the classes on my classes page. Look forward to seeing you…..